Administrators and teachers can now more conveniently view Imagine Español student usage in the Imagine Learning Portal. Educators can now see how much time their students have been using Imagine Español. 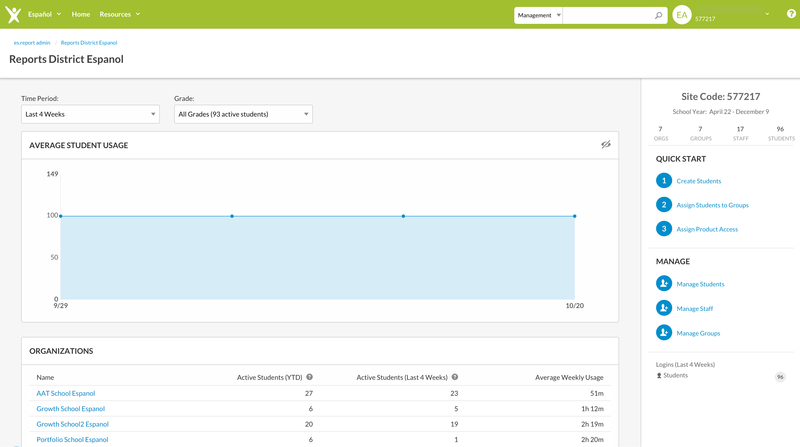 Administrators can see an overview of usage for each of their schools. Teachers can see usage for each of their groups and even drill down into specific students. Users will land on the Usage dashboard until future reporting dashboards are added. Searching for staff or groups now shows accurate results for organizations syncing with Clever. Groups can now be created outside of Clever for organizations that are syncing with Clever.